Color coding text is a technique that is especially useful at the beginning of the analysis process. It is similar to the marking of text in a book with a highlighter. It allows you to color code the passages you find particularly interesting when reading through the text for the first time. Before you decide which codes to use and before you start analyzing your text in categories, this technique lets you keep track of what seems important. MAXQDA also offers this functionality- The Code toolbar in the Document Browser contains five color coding highlighters. To color code a segment of text, follow a similar process as with standard coding: select the text segment with your mouse and click on one of the five colors in the toolbar. The text segment will now be highlighted in that color and color coded accordingly. A new coding stripe will be visible in the coding column next to the document. 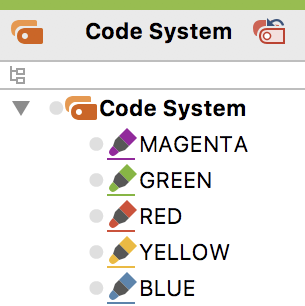 If at a later point, you delete the color code in the “Code System”, you are not only deleting the color code. All coded segments for that code will also be deleted. In other words, all the highlights of that color will be deleted from your documents (not the texts themselves, just the colors assigned to them). Tip: You can change the name of a color code in the “Code System” at any time.